Potential adoptive homes should be screened thoroughly before placing pigs. The screening process should include an application to gather personal information, a phone consult, a chance for the applicant to ask questions, and a meeting with the applicant and rescue pig. While thorough screening may seem intrusive, it is essential to ensure the pig will thrive for a lifetime with a well matched adoptive family. The pigs are dependent on their rescue organization to keep them safe even after placement. 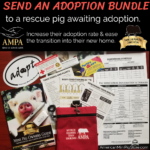 Many adoption placements have failed in the past due to zoning conflicts, frequent moves or travels, financial struggles, health struggles, and family members or household members that do not want the pig. 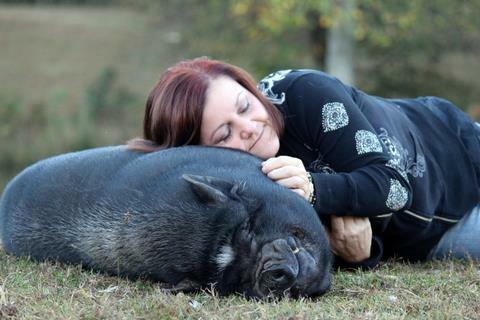 Some families adore their pets but are not a good match for a pig. There are also some people that seek pigs to cause harm, either through torture, dog fighting, hog dog hunt training, or terrible neglect. Don’t be afraid to ask questions. Responsible homes will not hesitate to answer as they have nothing to hide. When people become defensive or secretive, then concerns may arise. Keep in mind, while asking questions it is important to get an overall picture of the potential adoptive home, there is no cut and dry answer. Overly strict screening processes frequently turn away good families. These families are willing and able to offer a stable and loving home to a rescued pig but are turned away when we take the human compassion out of adoption screening. The following is a list of topics or questions that can be asked on an initial screening application to give the rescue an idea of the family and environment the pig will be living in. This will help the rescue decide whether or not a rescue pig is a good fit for the applicant, and also will help narrow down which particular pigs would be a good candidate for the family. Contact Information – You should have as much contact information for the applicant as possible. Full name, full physical address (no PO Box), phone number (work, cell, home), and email address. Reachable Time – Ask the applicant for the best times or days to be reached to ensure you can contact them at a convenient time. 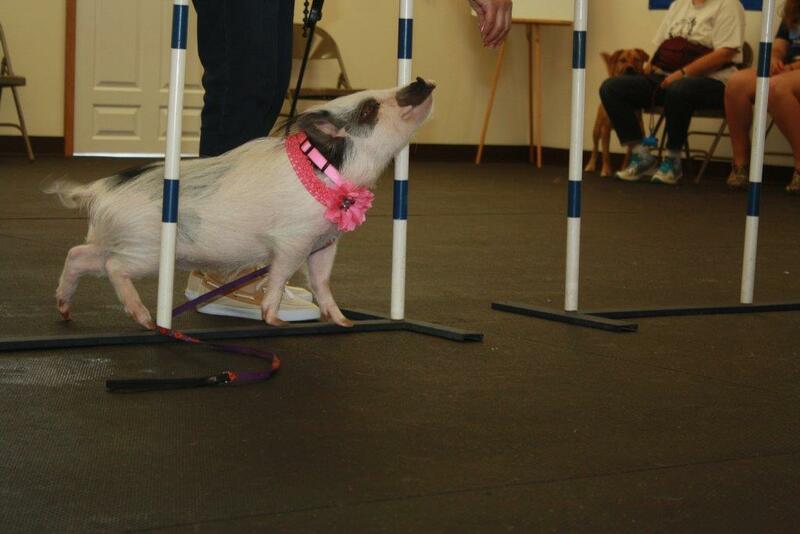 Physical Ability – The applicant should have the physical ability to care for the pig. Disabled persons or those with severe illness may not be up to the challenge physically that a pig provides. Animal Abuse or Cruelty Charges – Screening for animal abuse history is important. A common question is: Have you or a household member ever been convicted of animal neglect, abandonment, cruelty, or a similar offense against any animal? Have you ever had an animal confiscated by animal control or any other humane organization for violations of state or local laws or regulations? Children – The applicant should list names and ages of children living in the house. 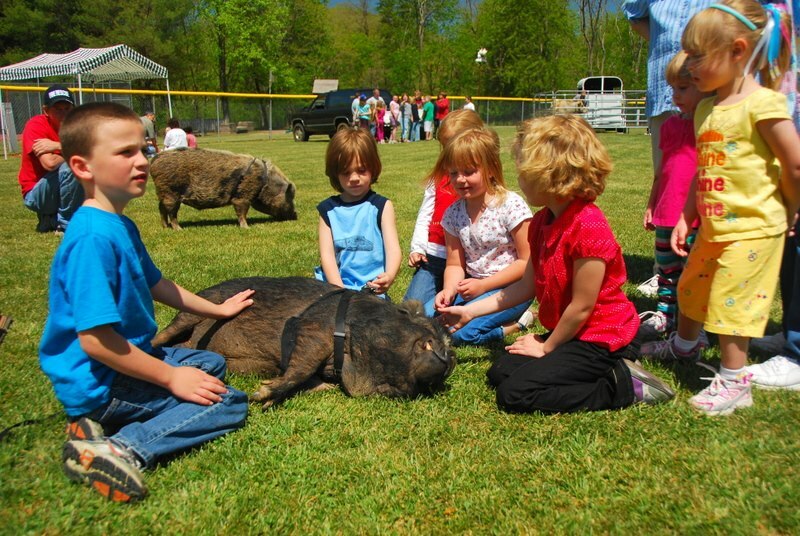 This will give you an idea of if there are very young children in the home that would require an especially patient pig, or a lot of rambunctious children that would need a laid back pig that is not timid, as well as discuss appropriate interactions between the children and pigs. Some concerns would be toddlers or small children walking around with food, small children feeding the pig by hand. Other Household Members – Who will be responsible for the care of the pig? Owner – Who is the animal for? Yourself or gift? 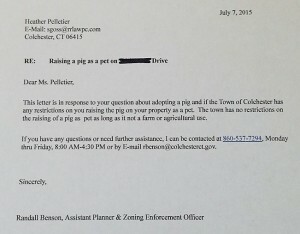 Zoning – An applicant should be zoned for pet pigs. 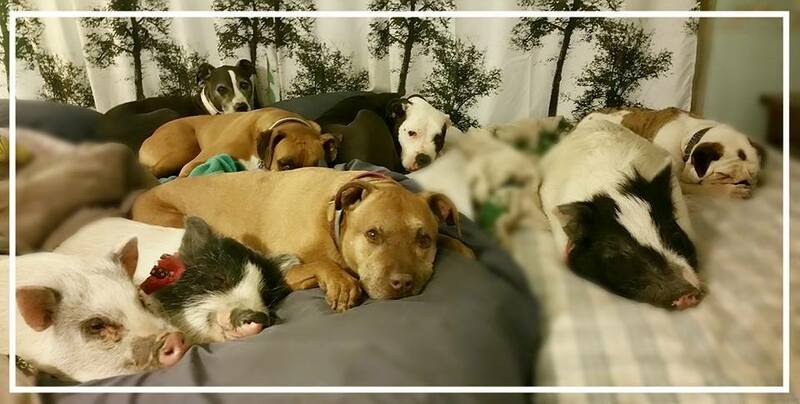 Ideally, the rescue organization will check with the appropriate officials for each applicant to ensure the pig will not be displaced due to zoning after the adoption. 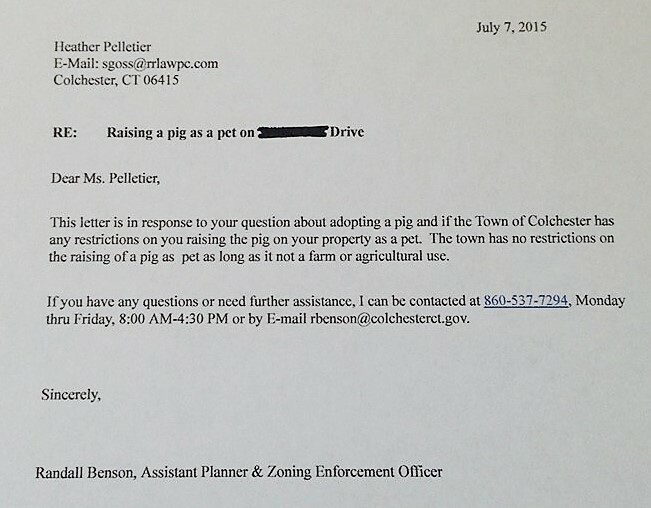 If this check is not possible, a letter from the city stating the pig is allowed would suffice. Own or Rent – If an applicant is a renter, they should be able to provide written permission from the landlord for the specific pig they would like to adopt. 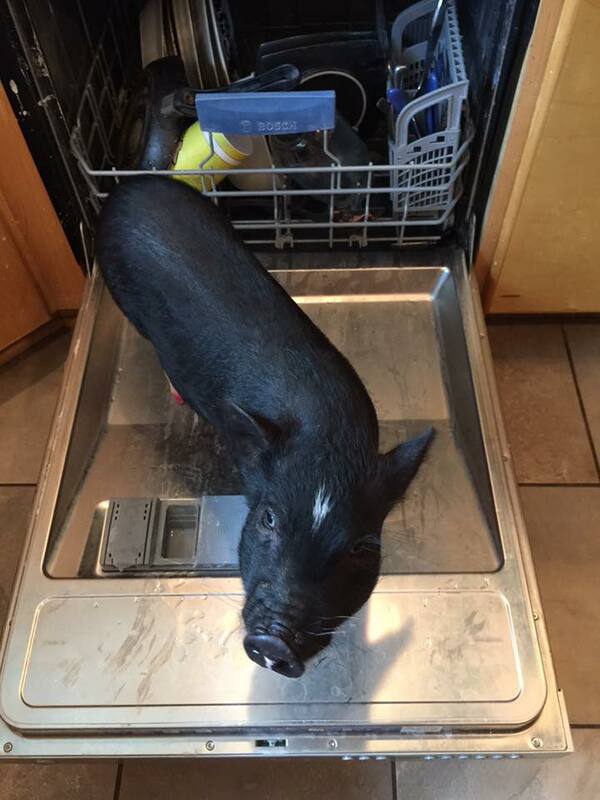 Some landlords will allow “pets” or “small pigs” but not a 100 pound pig. Renters should also have a plan in place if they are forced to move when the lease has expired, how will they find another suitable home that allows their pig? What will they do if they run into trouble finding pig friendly housing? Planned Community – If the applicant lives in a planned community such as a Home Owners Association they should be able to provide written permission for the specific pig they are looking to adopt. How long at current address? This isn’t a deal breaker, but does show how stable their housing situation is. Plan to move? If the applicant plans to move in the near future then it may be wise to wait until they are settled into their new home to adopt a pig. This will give them a chance to ensure the pig is allowed by ordinance and any landlords, covenants, or home owners association. They will also have a chance to line up a local veterinarian. 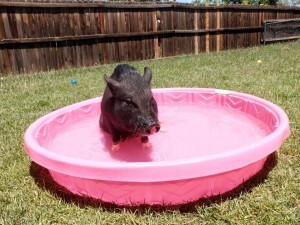 By waiting until after the move to adopt a pig they will lessen the stress and hardship on that pig. Financial Ability – The applicant should be financially capable of caring for a pig, for the duration of its life. If the pig has special needs then those costs should be considered as well. Routine care, emergencies, and age related ailments or medications should be considered by the applicant. Emergency Funds – The applicant should have a plan for funding emergencies. Unfortunately, unexpected situations occur. Families split, sudden moves are necessary, hurricanes or natural disasters force people out of their homes, medical emergencies happen, toxic plants are ingested, bowels become compacted, pigs are attacked by dogs or hit by a car, they can break a leg, seizures, illness & disease are all reasons that a substantial amount of money may be needed on short notice. Some options may be credit cards or a savings account. An applicant that cannot fund an emergency is not prepared to bring a pig into their home. Other pigs spayed/neutered – If the applicant has other pigs as pets, they should be spayed and neutered. If they are not altered, an explanation is necessary to move forward. For example, if there is financial reasons they have not altered their pet pig, then they are not ready to bring in another pet. If they do not believe in spaying/neutering then they would benefit from more education before bringing in another pet pig. If they have not found a veterinarian to perform the procedure, then they should find a veterinarian before bringing in another pet pig. Veterinarian – The applicant should have a local veterinarian, experienced with pet pigs, that is willing and able to care for the adopted pig. 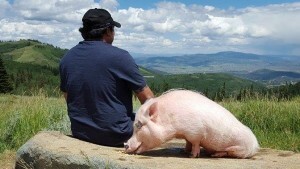 They should have already confirmed with this veterinarian the care he or she is able to provide for the adopted pig. 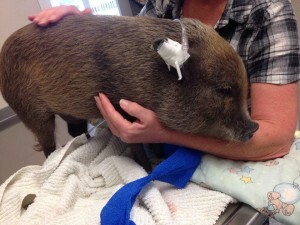 The applicant should also have a 24 hour emergency vet that is close to their home and that is willing and able to treat their pig in an emergency. The applicant should provide contact information for both clinics on their application. The applicant should also have a way to transport the adopted pig to the veterinarian. A veterinary reference is also valuable as it can provide a history of care for the applicant’s other pets, even if they are not pigs. If their other pets have received routine care from a veterinarian, this shows responsibility and financial dedication to their pets. Pets at Home – The applicant should identify other pets in the home. This information will help match up a pig that is a good fit, as well as point out any areas of concern or areas that need further education. How long the applicant has had such pet will also offer insight into how dedicated or impulsive they are. concern or areas that need further education. If an applicant has had a pet pig before, asking what happened to that pig will help shed light on their role as pet owners. The pet may have passed away from natural causes, been rehomed, relinquished to a shelter, or met a tragic and preventable death due to negligence. 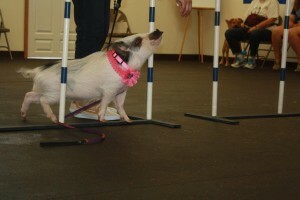 Training – Questioning the application about their interest in training, their experience with training, and their comfort level with training will give you a better idea of which pig would be a good match for their household. Some pigs will have a great training foundation with a mild disposition and well mannered. Other pigs will need more dedication and patience in the areas of training. This is where a good pig owner might simply not be a good match for a particular pig. socializing will give you a better idea of which pig would be a good match for their household. Questions regarding socialization will give you an idea of whether they are interested in an unsocialized pig and able to work with that pig. If the application is a good match for an unsocialized pig, this may be a perfect opportunity to find a loving home for a difficult to place pig. If they are not willing or able to socialize a pig then care should be taken to match them with a well socialized pig. bonded to another pig at the rescue or in their previous home. A great question on the application is to ask if they are willing to adopt a pair of bonded pigs. Gender – There should be a question on the application on whether the family has a gender preference of their adopted pig. This will help you find a suitable pig to match to their preferences. Age – There should be a question on the application on whether the family has an age preference of their adopted pig. This will help you find a suitable pig to match to their preferences. Chris P. Bacon with his dedicated dad, Len. Health – Inquiring on the family’s interest and ability to care for a special needs pig may help to match them up with a difficult to place pig. If they are not interested in special needs pigs then the rescue can ensure to match the family with a healthy pig. Color – There should be a question on the application on whether the family has a color preference of their adopted pig. This will help you find a suitable pig to match to their preferences. Other qualities of importance – Asking if there are any other particular qualities of importance opens the door for the applicant to express any concerns or special interest. Travel/vacations – How often does the applicant travel for work or vacation? The family should have a plan in place for the care of their adopted pig while they are on vacation, travels for work, or emergencies such as a death in the family. Hours away from home – Asking how many hours the applicant is away from home per day will give the rescue an idea of how much alone time the pig will endure as well as how much time the applicant has to devote to their rescued pig. Containment – Where will the pig stay while family is at work? Will the pig spend those hours in a crate, free roam of the house, locked in a bedroom, or outdoors in a weather appropriate shelter? Lost pet – Asking what steps the applicant would take in the event their pet is lost will give great insight into their dedication and planning. Euthanasia – Asking the applicant of their views on euthanasia and in what situations it would be warranted will give insight to their views on the matter. Opinions of acceptable euthanasia vary widely. 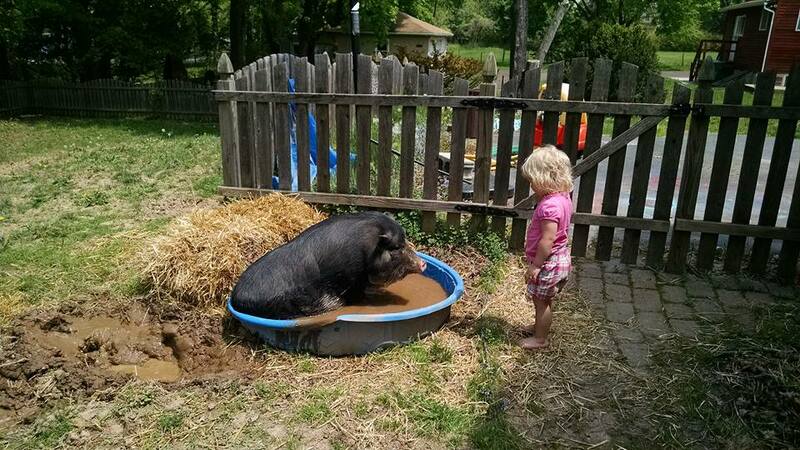 It’s best to come to an agreement before the pig is placed in their care. There have been cases where families felt it was acceptable to euthanize a pet when the behavioral problems were above the families training level. Other families have euthanized pets instead of getting proper medical treatment. Why a pig? 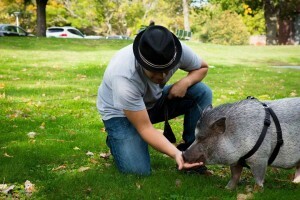 – Asking an applicant why they want a pet pig will offer insight into their motives and decision. There is no right or wrong answer to this open ended question, but will provide valuable information to the rescue. Questions – Asking if the family has any questions or concerns about caring for a pig opens the door for discussion and also gives the rescue insight into areas the applicant is lacking in pig education. Meeting – Asking if the applicant or family would be interested in meeting several adoptable pigs before making an adoption decision will allow insight as to whether they are set on a particular pig they haven’t met, or if they are open to finding the right match. 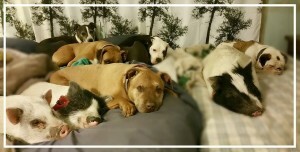 Foster – Asking if they are open to fostering a pig may be an opportunity for the applicant to foster while waiting for the perfect match, OR to foster while deciding if a pig is the right pet for them. Transport – Asking how far they are willing to drive to pick up an adoptable pig will give you information on their abilities to transport, their dedication, and aid in finding a pig within their travel radius. Home Visit – Asking if they will allow a volunteer or representative of the rescue to visit for a home visit is important before scheduling such a visit. Many times people do not tell the truth on applications because they think no one will find out. A home visit will ensure the property and fencing is appropriate as well as give you a better feel for the family and their desire for a pet pig. Adjustment – Asking what the applicant considers an acceptable adjustment period for the adopted pig and the pets already in your home will give the rescue an idea of the applicant’s patience and expectations. This also provides an opportunity for education if the applicant has unrealistic expectations. Indoor / Outdoor / Both – Asking where their adopted pig will spend his/her time will help to match up the most appropriate adoptable pig as well as ensure their expectations and property are setup for the pig. Pig proofing – Asking what they have done to pig proof the house and prepare for the pig will give the rescue insight to any areas that are lacking. 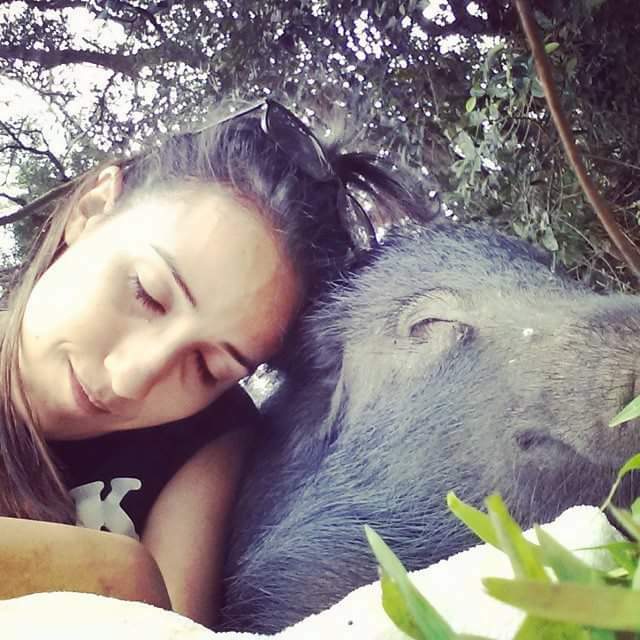 Sleeping area – Asking where the pig will sleep will also open the door of communication, to ensure the applicant’s preparations and expectations are in line with an adopted pig. 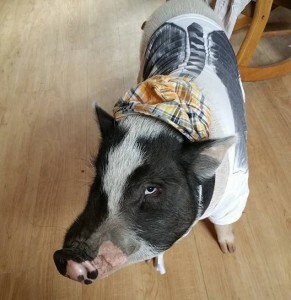 free roam of house, or other area) will ensure the applicant’s preparations and expectations are in line with an adopted pig while opening the door of communication for further education. Fenced in Yard – Many pigs thoroughly enjoy spending time in a fenced in yard. Asking the applicant whether or not they have a fenced in yard will help determine which pig may be a good match for their housing situation. Type of fencing, size of fencing, and how it is reinforced to prevent escapes. Separate Pig Area – Applicant should understand that pigs will destroy yards and landscaping. Does the applicant have a plan in place to protect areas they do not want their adopted pig to root up? 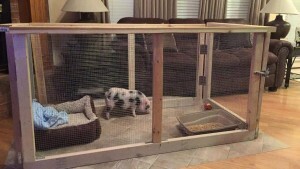 Containment – The applicant should have a plan for containing the pig while they are not home. This is best done with sturdy fencing. Asking an open ended question such as “How will your pig be contained while you are away from home?” will allow them to use their own words while identifying any weak areas of their planning. Insulated winter house – The applicant should have a house for the pig that is well insulated for the winter months, to protect the pig from wind, snow, cold air, and water. Heated house – The applicant should have a house that is heated for winter OR have a plan in place to provide adequate heat during winter months, depending on the region they live in. Some alternatives to a heated house are a well-insulated house, pig friends to snuggle with, and deep bedding such as straw. Wading pool or mud for summer – Pigs outdoors should be supplied with a wading pool or a muddy area during the summer months to protect them from overheating, sunburn, and insects. Shade – Pigs outdoors should be provided with shade to protect them from the sun and overheating. The applicant should be questioned on his or her knowledge and education of owning and living with pet pigs. This can be addressed on the initial screening application, or during a phone or personal interview. Keeping these questions open ended will give the rescue valuable insight to areas the applicant may need assistance before welcoming a pig into their home. In what way have you educated yourself on the care of pigs? Books, Facebook groups, websites, friends with experience, etc? Red flags are not an automatic denial of adoption. Rather, they are important key points that should be evaluated along with the overall picture. Sometimes red flags will alert the rescue to a potential issue that may or may not be resolvable before adopting a pig. Some applicants will need more education before adopting while others are simply not a suitable match for a pet pig, or a lifetime commitment. 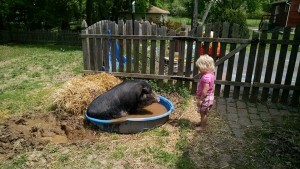 Size – If the family has a size or weight limit for the adoptive pet pig, then a pig may not be the right choice for them. History of rehoming – If the family has a history of rehoming pets then the situation and frequency should be evaluated and taken into consideration. While there are times it is truly in the best interest of the pet to find a new loving family, there are some people that do not take the responsibility of pet care seriously. 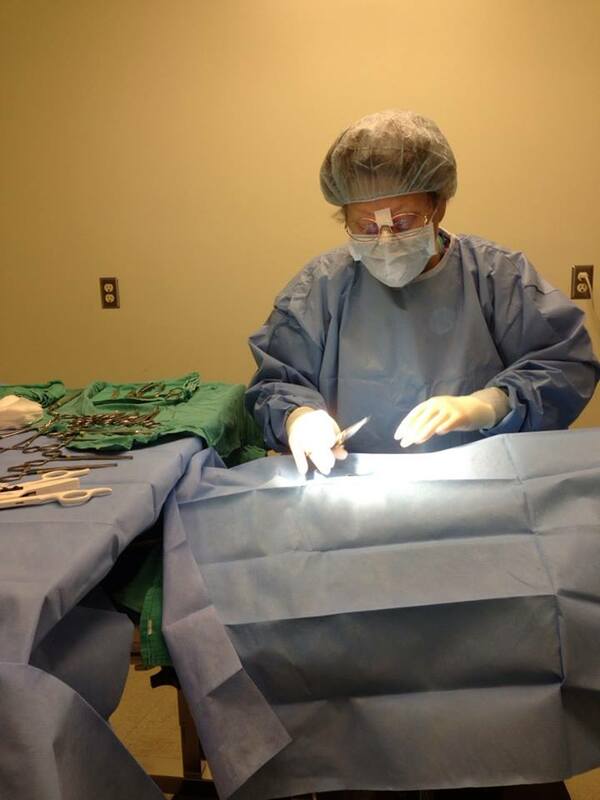 Veterinary care – Family pets should have appropriate veterinary care provided, should be in good health, family should have a veterinarian enlisted to care for the new pig. Hesitation – If the applicant is hesitant or unsure of adoption, they may not be ready to make the commitment. 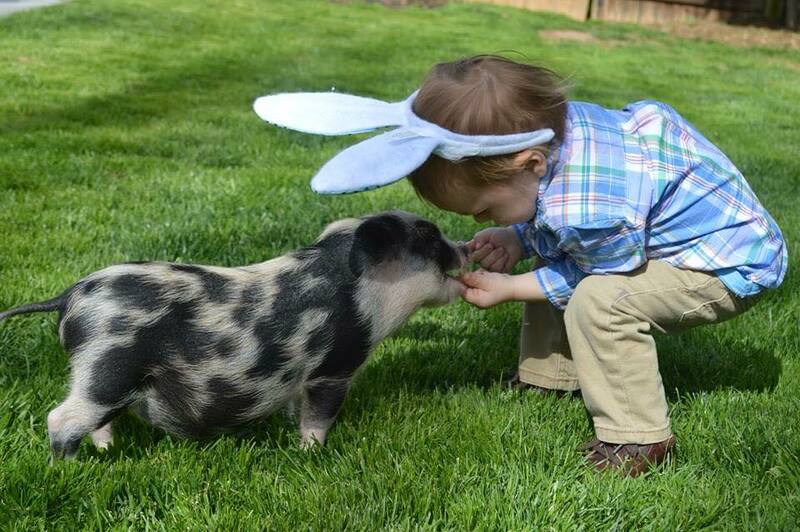 Children’s interactions – If small children live in the home they would need to be comfortable around the pig as well as having basic manners and respect. The children should not fear the pig or panic when the pig explores. Hunters – Hunting for food or sport is not necessarily a red flag. However, there are individuals that look for free or cheap pigs to use as training for their hog hunting dogs. This is especially prevalent in some states. Keep in mind, this is not something hunters should be accused of, but something to keep in mind as the screening process will weed out unsuitable individuals. Pregnancy – If the family is expecting a child soon, it may be better to hold off on adopting a pig. 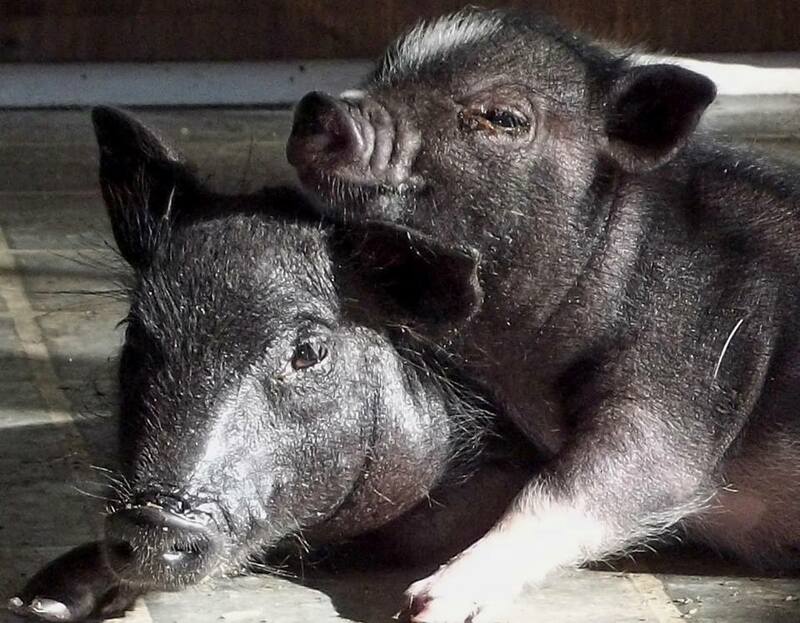 Pigs are not easy pets and a shift in the household has caused many pigs to lose their homes. Apartment or lacking outdoor space – If the family lacks appropriate outdoor space for the pig, they are more likely to run into behavioral and destructive problems with their pig. Veterinarian – If the applicant does not have an appropriate vet for routine care as well as 24 hour emergency care, then they are not prepared to bring a pig into their lives just yet. Zoning – If the applicant does not know what zoning is, or has not checked their individual laws, then they need to do more research before adopting a pig. Home visit refusal – If the applicant does not allow you to visit for a home check, they may not have given complete truths on their application form. Age – If the applicant is under the age of 21, they may have significant life changes in the near future that would affect their adopted pig. Social media – If the applicant’s social media accounts show irresponsible pet ownership or neglect then it may be assumed they would treat the adopted pig in the same fashion. Focus on piglets – If the applicants focus is only on piglets and they show no interest in the adult pigs then care should be taken to ensure they are in fact looking at providing a home for the pig even as he or she matures. Containment – If the family plans to use an electric collar or underground fence to contain their pig while they are away, this can be very dangerous. Underground fences may keep the pig in, but do not keep the predators out. This leaves the pig very vulnerable to loose dogs and other animals that will bring harm to the pig.